Here in Vermont we call the most rural corner of our state the Northeast Kingdom. The Kingdom is mostly full of empty space and farms, but it does have more then its fair share of magical spots. One day while I was driving past a castle in the Northeast Kingdom (no joke, it’s a real castle) I was inspired to design a pair of gloves with closed loop cables all around the wrist and up the hand. 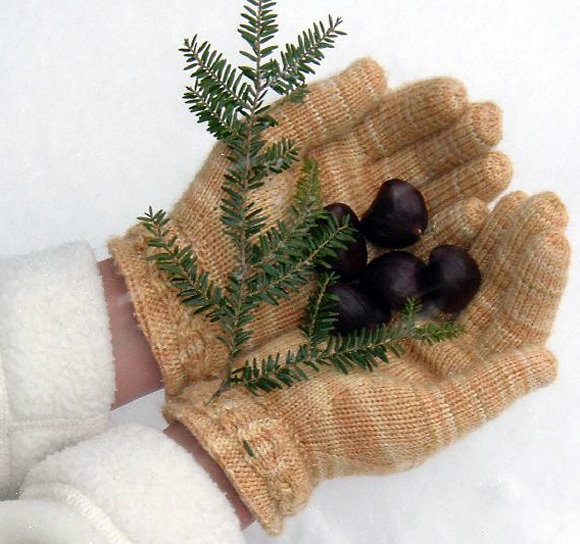 These gloves keep hands warm and allow dexterity during chilly winters. The celtic-inspired cables add embellishment perfect for whatever kingdom or country you chose to wear these in. These gloves are complex, but still a very quick knit. One pair of gloves uses about the same amount of yarn as a single sock and can be knit just as quickly! In fact you can get two pairs of size medium gloves out of just one skein (or one pair size small and one pair size large, you get the idea). The cable pattern directions are written using a cable needle. However, this project will likely go more quickly if you can cable without a needle – why not use this as a chance to learn? 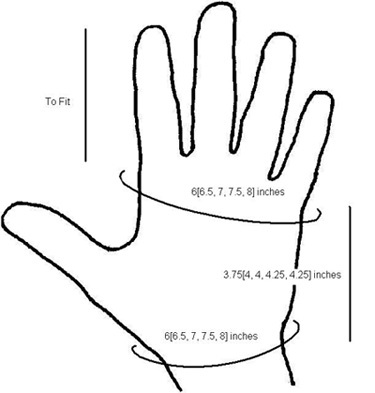 For a well-fitted glove, choose the finished measurements closest to your actual measurements. Schaefer Yarn Heather [55% merino wool superwash, 30% silk, 15% nylon: 400yd/366m per 4oz skein]; color: Chamomile; 1 skein. Solid and semi-solid colors are recommended. On RS: Sl next st to cable needle and hold to front of work; k1 from left needle, k1 from cable needle. On WS: Sl next st to cable needle and hold to front of work; p1 from left needle, p1 from cable needle. C2R: Sl next st to cable needle and hold to back of work; k1 from left needle, k1 from cable needle. C2LP: Sl next st to cable needle and hold to front of work; p1 from left needle, k1 from cable needle. C2RP: Sl next st to cable needle and hold to back of work; k1 from left needle, p1 from cable needle. C3L: Sl next 2 sts to cable needle and hold to front of work; k1 from left needle, k2 from cable needle. C3R: Sl next st to cable needle and hold to back of work; k2 from left needle, k1 from cable needle. C3LP: Sl next 2 sts to cable needle and hold to front of work; p1 from left needle, k2 from cable needle. C3RP: Sl next st to cable needle and hold to back of work; k2 from left needle, p1 from cable needle. T3L: Sl next st to cable needle and hold to front of work; k2 from left needle, k1 from cable needle. T3R: Sl next 2 sts to cable needle and hold to back of work; k1 from left needle, k2 from cable needle. T3LP: Sl next 2 sts to cable needle and hold to front of work; k1 from left needle, slip second st on cable needle to left needle, p this st; k1 from cable needle. C4L: Sl next 2 sts to cable needle and hold to front of work; k2 from left needle, k2 from cable needle. C4R: Sl next 2 sts to cable needle and hold to back of work; k2 from left needle, k2 from cable needle. M2K: [K into back loop, p into front loop, k again into back loop] of next st. 1 st increased to 3 sts. M2P: [K into front loop, then back loop, then front loop again] of next st. 1 st increased to 3 sts. 3-st dec: From right to left, next 3 sts on left needle are designated sts A, B and C. Sl sts A and B to right needle, pass st A over st B. Sl st B back to left needle, pass st C over; k remaining st (st B). 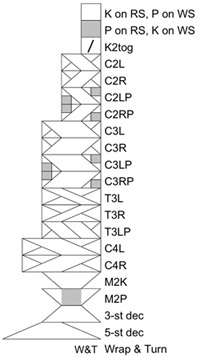 3 sts have been decreased to 1 st.
5-st dec: From right to left, next 5 sts on left needle are designated sts A, B, C, D and E. Sl sts A, B and C to right needle, pass st B over st C. Sl st C back to left needle, pass st D over. Sl st C to right needle, pass st A over. Sl st C back to left needle, pass st E over; k remaining st (st C). 5 sts have been decreased to 1 st.
Wrap and turn. If yarn is at front of work, bring it between needles to back of work; if it at back of work, bring it between needles to front of work. Slip next st, and bring yarn between needles, returning it to its previous position. Turn work, to begin working next row. Note: Cuff is worked back and forth on two needles. If preferred, straight or circular needles can be used instead of double-point needles. Using crochet cast on or other provisional cast on method, CO 24 sts. Set-up Row [WS]: Sl 1, k9, p1, k4, p4, k5. Note: While working the cuff, first st of each row will be slipped. Row 1 [RS]: Sl 1, work Row 1 of Chart A over next 12 sts, k1, p10. 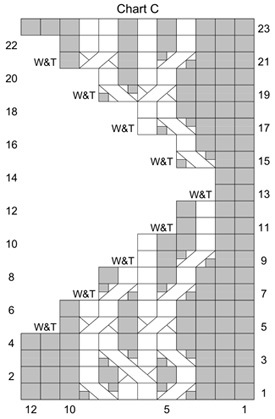 Row 2 [WS]: Sl 1, k9, p1, work Row 2 of Chart A over next 12 sts, k1. Sizes XS and S: Work Rows 3-16 of Chart A.
Sizes M and L: Work Rows 3-16 of Chart A, then Rows 1-6 once more. Size XL: Work Rows 3-16 of Chart A, then Rows 1-16 once more. Before continuing to Chart B, review notes in Pattern Notes re. turning short rows (Wrap and Turn). The short rows in Chart B will cause the cable to turn 90 degrees to the right. Work Rows 1-11 of Chart B. 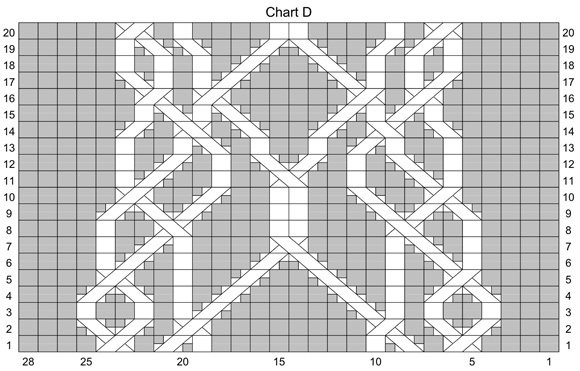 Next Row (Row 12 of Chart B) [WS]: BO 10 sts knitwise, work Row 12 of Chart B. Work Rows 13-22 of Chart B, purling last st of RS rows and slipping first st of WS rows. Break yarn, leaving a tail approx. 4 inches long. Place all sts on st holder. Carefully remove waste yarn from CO edge, placing 23 resulting live sts on needle. Attach yarn with WS facing. Important Note: Pattern will not match up perfectly with first half of cuff; it will be offset by half a stitch. Row 1 [WS]: Sl 1, kfb, k2, p4, k4, p1, k10. As for first half of cuff, first st of each row is slipped. First half of each row (when looking at work with RS facing) is worked in reverse stockinette st, center st is worked in stockinette st, and cable panel is worked over last half of row. Sizes XS and S: Work Rows 15-16 of Chart A, then Rows 1-16. Sizes M and L: Work Rows 5-16 of Chart A, then Rows 1-6. Size XL: Work Rows 5-16 of Chart A. Chart C mirrors Chart B, turning the cable 90 degrees to the left. 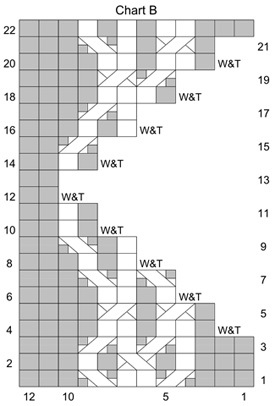 Work Rows 1-12 of Chart C.
Next Row (Row 13 of Chart C) [RS]: BO 10 sts purlwise, work Row 13 of Chart C.
Work Rows 14-23 of Chart C, slipping first st of RS rows and knitting last st of WS rows. Do not break yarn. If you have been using straight or circular needles to knit the cuff, transfer sts to double-point needle. Using a new double-point needle and continuing from sts just worked, pick up and k 1 st in each slipped st along edge of cuff: approx. 20[20, 24, 24, 26] sts. Divide these sts evenly between 2 needles. Place 14 held sts of first half of cuff on needle. Continuing from picked-up sts, work first half of Row 1 Chart D over these 14 sts; join to work in the round, being careful not to twist; using same needle, work second half of Row 1 of Chart D over 14 sts from second half of cuff. This needle will now be designated Needle 1. K all sts on remaining 2 needles (Needles 2 and 3), evenly increasing 0[2, 2, 6, 8] sts. This point (end of Needle 3) will now be beginning of round. 48[50, 54, 58, 62] sts: 28 sts on Needle 1, 10[11, 13, 15, 17] sts each on Needles 2 and 3. The next round is worked differently for right and left hands. For sizes XS and S, you will be directed to place a stitch marker at a point between needles; instead, the division between needles will act in place of a stitch marker. If desired, place a removable marker in the work at this point. Right Hand: Work Round 2 of Chart D over sts on Needle 1; k0[0, 2, 2, 4], place marker, k4, place marker, k16[18, 20, 24, 26]. Left Hand: Work Round 2 of Chart D over sts on Needle 1; k16[18, 20, 24, 26], place marker, k4, place marker, k0[0, 2, 2, 4]. Pattern is set for hand: over sts on Needle 1, work through all rounds of Chart D, then Chart E; over sts on Needles 2 and 3, work in stockinette st, shaping thumb gusset as directed below. Work 2[3, 4, 5, 6] rounds in pattern before proceeding to thumb gusset. Note for Sizes XS and S Only: For right hand, division between Needle 1 and Needle 2 takes place of first marker. For left hand, division between Needle 3 and Needle 1 takes place of second marker. Gusset Increase Round: Work in pattern to first marker, slip marker, RLI, k to second marker, LLI, slip marker, k to end. Repeat these 3 rounds 2[4, 4, 6, 6] times more, then work Gusset Increase Round once more. 56[62, 66, 74, 78] sts: 12[16, 16, 20, 20] sts between markers. Work 4[4, 4, 4, 6] more rounds in pattern without further shaping. Next Round: K to first marker, remove marker, place next 12[16, 16, 20, 20] sts on hold on waste yarn, CO 4 sts, remove second marker, join to continue working in the round, k to end of round. 10[11, 13, 15, 17] sts each on Needles 2 and 3. Continue in pattern until all rounds of Chart E have been completed. 49[51, 55, 59, 63] sts. Size XS Only: Work Rounds 1-9 of Chart F.
Sizes S and M Only: Work Rounds 1-13 of Chart F.
Sizes L and XL Only: Work Rounds 1-15 of Chart F.
Slip all sts from Needles 2 and 3 to st holder or spare needle. Set up as described below in section for each hand, working fingers in given order. Work sts from Needle 1 (sts in cable pattern) following Chart G, working Rounds 1-15 once, then Rounds 16-20 as needed until work measures 1.25-1.75 inches less than desired length, then Rounds 21-27. (If necessary for shorter fingers, Rounds 16-20 may be omitted.) Work all other sts in stockinette st.
On last round of Chart G, finish 1 st before end of round; last st of round will now be first st of next round. Chart H begins 1 st to the right of the sts which had been worked following Chart G, and ends 1 st to the left of these sts. Work Rounds 1-3 of Chart H.
Continue in stockinette st until finger is desired length. Next Round: [K2tog] to end. Break yarn, draw through all sts and pull tight. Thread yarn through sts again to secure. When working first round of each finger as described below, work first round of Chart G over sts from Needle 1. For first 2 fingers of this hand, the 8 sts of Chart G will be worked over the 7 sts worked from Needle 1, and the first CO st following these sts. Little Finger: Slip last 5[5, 6, 7, 8] sts from holder to new double-point needle. This will be third needle of round. Work 7 sts from Needle 1 onto first needle of round, CO 2[2, 3, 3, 3] sts onto second needle of round, work 5[5, 6, 7, 8] sts from third needle of round. Redistribute sts and join to work in the round. 14[14, 16, 17, 18] sts. Ring Finger: Slip last 3[4, 4, 5, 6] sts from holder onto new needle. Attach yarn and k these sts, then CO 3[4, 4, 4, 5] sts onto this needle. This will be third needle of round. Work 7 sts from Needle 1 onto first needle of round, CO 3[4, 4, 4, 5] sts onto second needle of round, work 6[8, 8, 9, 11] sts from third needle of round. Redistribute sts and join to work in the round. 16[19, 19, 20, 23] sts. Middle Finger: Slip last 6[6, 8, 9, 10] sts from holder onto new needle. Attach yarn and k these sts, then CO 3 sts onto this needle. This will be third needle of round. Work 8 sts from Needle 1 onto first needle of round, following Chart G; CO 3 sts onto second needle of round, work 9[9, 11, 12, 13] sts from third needle of round. Redistribute sts and join to work in the round. 20[20, 22, 23, 24] sts. Index Finger: Slip remaining 6[7, 8, 9, 10] sts from holder onto two new needles. These will be second and third needles of round. Attach yarn and k these sts, then CO 4 sts onto third needle. Slip last CO st to new first needle of round; this st will be first st of Chart G. Onto same needle, work remaining 7 sts from Needle 1 following Chart G. Work 9[10, 11, 12, 13] sts from second and third needles of round. Redistribute sts and join to work in the round. 17[18, 19, 20, 21] sts. Index Finger: Slip last 6[7, 8, 9, 10] sts from holder to new double-point needle. This will be third needle of round. Work 7 sts from Needle 1 onto first needle of round, following Chart G; CO 4 sts onto second needle of round. 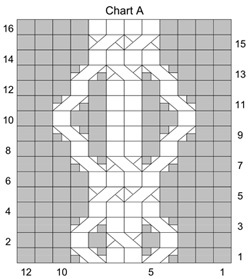 Work first CO st as last st of Chart G. Work 6[7, 8, 9, 10] sts from third needle of round. Redistribute sts and join to work in the round. 17[18, 19, 20, 21] sts. Ring Finger: Slip last 3[4, 4, 5, 6] sts from holder onto new needle. Attach yarn and k these sts, then CO 3[4, 4, 4, 5] sts onto this needle. This will be third needle of round. Slip last CO st to new first needle of round; this st will be first st of Chart G. Onto same needle, work 7 sts from Needle 1 following Chart G. CO 3[4, 4, 4, 5] sts onto second needle of round, work 6[8, 8, 9, 11] sts from third needle of round. Redistribute sts and join to work in the round. 16[19, 19, 20, 23] sts. Little Finger: Slip remaining 5[5, 6, 7, 8] sts from holder onto two new needles. These will be second and third needles of round. Attach yarn and k these sts, then CO 2[2, 3, 3, 3] sts onto third needle. Slip last CO st to new first needle of round; this st will be first st of Chart G. Onto same needle, work remaining 7 sts from Needle 1 following Chart G. Work 6[6, 8, 9, 10] sts from second and third needles of round. Redistribute sts and join to work in the round. 14[14, 16, 17, 18] sts. Place 12[16, 16, 20, 20] held sts from thumb gusset onto two needles. Join yarn and using a third needle, pick up and k 6 sts in CO edge at point where gusset joins hand: 1 st at each side of CO sts, and 1 st in each CO st. 18[22, 22, 26, 26] sts. First Round: Using needle which holds picked-up sts, k first 3[5, 5, 6, 6] held sts; this will be Needle 1. Using another needle, k next 6[6, 6, 8, 8] held sts; this will be Needle 2. Using another needle, k last 3[5, 5, 6, 6] held sts, then first 3 sts from Needle 1; this will be Needle 3. Beginning of round is located at center of picked-up sts. Work all sts in stockinette st until thumb measures 0.5 inches. Decrease Round: K2tog, k to last 2 sts of round, ssk. Repeat these 3 rounds once more. 14[18, 18, 22, 22] sts. Continue in stockinette st until thumb is desired length. Sew together CO edges between fingers. Fold reverse stockinette st band at lower edge of cuff to inside of cuff (stockinette st ridge forms a natural fold line) and sew in place, taking care not to sew too tightly. Weave in ends and block. Lightly stretch cuffs during blocking so that cables are spread out. 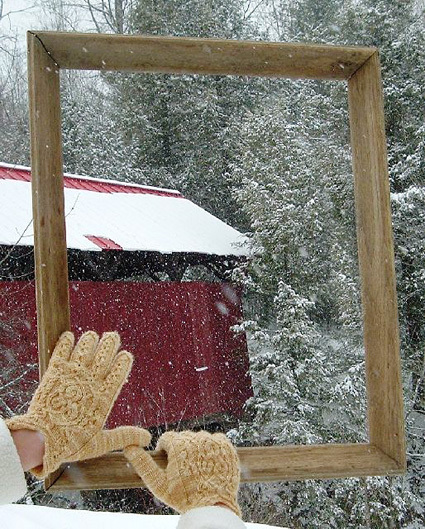 Becky lives in Lamoille county in Vermont with her husband Neil, two cats and two dogs, and a growing number of farm animals. She knits and designs on the bus to her real job every day. She can be found on Ravelry as ladysaphira and blogs here.